METHODS: This study evaluated both grading systems for their ability to predict the bivalent outcome, recovery, within a sample of 118 whiplash patients who were part of a previous case-control designed study. Of these, 36% (controls) had recovered, and 64% (cases) had not recovered. The discrete bivariate distribution between recovery status and whiplash grade was analyzed using the 2–tailed cross-tabulation statistics. In 1993, a formal whiplash grading system was introduced by Croft, [5, 6] and in 1995, a modified version was published by the Quebec Task Force on Whiplash-Associated Disorders (QTF-WAD). These grading systems are compared in Table 1. Subsequent reports have indicated some correlation between outcome and grade of severity, [8–15] but most authors have studied only grade 1 and 2 injuries. The purpose of the present study was to assess the ability of these grading systems to predict clinical outcome using a study population that was part of a separate case-control study. To our knowledge, this is the first clinical study to compare these 2 whiplash grading systems and the first study to include a sample with representative proportions of all 4 grades of whiplash injuries. In this study, the criteria described in Table 1 were used in the assignment of whiplash grades for grades 1–3. Treating practitioners also characterized injuries as grade 4 when magnetic resonance imaging (MRI) findings were considered to be consistent with the patient’s injuries. Relevant MRI findings would include, but not be limited to, herniations of intervertebral disks, annular tears, and type I Modic changes. The discrete bivariate distribution between recovery status and whiplash grade was analyzed using the 2–tailed cross-tabulation statistics module provided in SPSS 22 (IBM) statistical software. χ2 test results were as follows: Pearson χ2 (3 df) = 14.420 (P = .002), likelihood ratio (3 df) = 14.947 (P = .002), and linear-by-linear association = (1 df) 11.390 (P ≤ .001). Symmetric measures, including Cramer V (.350), Spearman correlation (–.322), and Pearson R (–.312), were all statistically significant (P < .001). The negative correlation coefficient resulted from the use of dummy variables (0 = not recovered; 1 = recovered) and implied that a less favorable recovery response was correlated with an increasing whiplash severity level gradient; grade 1 was associated with the most favorable outcome, whereas grade 4 was associated with the least favorable outcome. χ2 test results were as follows: Pearson χ2 (2 df) = 7.532 (P = .023), likelihood ratio (2 df) = 8.616 (P = .013), and linear-by-linear association (1 df) = 5.549 (P = .015). Symmetric measures, including Cramer V (.253), Spearman correlation (–.224), and Pearson R (–.218), were all statistically significant (P < .015–.023). Because none of the cases or controls met the definition of a grade 4 injury and many did not meet the definition for grade 3, there was substantial collapsing into the grade 2 and 3 categories. Although the correlations remained statistically significant, the lower coefficients and resulting significance levels are the result of this telescoping of data. To our knowledge, this is the first clinical whiplash study to formally compare 2 published whiplash grading systems as well as to include the entire spectrum of whiplash severity grades. 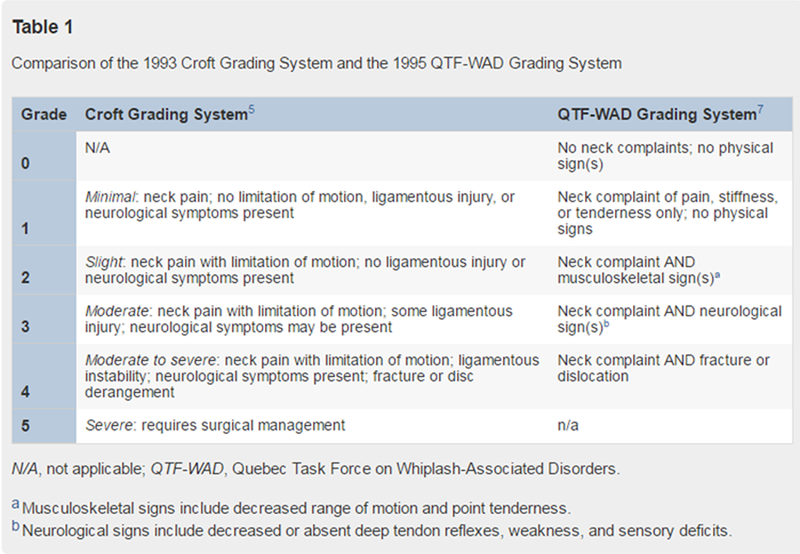 The first whiplash grading system was developed by Croft  in 1993 and later promulgated in 1995 with some modifications by the QTF-WAD. In either form, it provides a means to more precisely characterize whiplash injuries. Several published studies have indicated that the modified grading system has some ability to predict recovery status, but the majority of the studies have included only grade 1 and grade 2 injuries, preventing broader interpretation of the entire spectrum of injury severity. Moreover, although the present study did not address the issue directly, we believe that persons with grade 1 injuries do not often seek medical attention and that many of the grade 1 patients in previously published studies would, with more careful adherence to the grading criteria (Table 1), be deemed grade 2 injuries. Both grading systems can be said to possess reasonable predictive validity across the entire spectrum of injury severity. The original Croft grading system outperformed the QTF-WAD grading system because the original definitions for grade 3 and grade 4 injuries more closely reflect and accommodate the varying nature of injuries occurring in real-world motor vehicle trauma. The QTF-WAD’s decision to include a grade 0 (noninjury) and their omission of a grade representing the extreme of the injury continuum might be viewed as unorthodox by some, but in a practical sense, these are grades that are rarely assigned. Table 1 demonstrates that both of the proposed grading systems share the framework of the original work of Norris and Watt  and do not differ substantially across grades 1 and 2. The variations between the 2 higher grades and their probable effects are discussed below. The QTF-WAD’s subtle definition change for the original definition proposed by Croft in the grade 3 category was entirely consistent with the original work of Norris and Watt. The rationale for the term neurological symptoms in the original grading system arose from observation that paraspinal soft tissue injuries often produce a type of referred symptoms and that patients with ligamentous instability often develop chronic pain. This link between deep soft tissue injury, referred pain, and tendency toward chronicity may explain why upper extremity neurological symptoms — even those that do not correspond to an actual neurological injury — may nevertheless serve as an important prognostic bellwether. This referred symptom phenomenon was examined by Kellgren  in the late 1930s. This concept was developed further on an experimental basis in the 1940s by Inman and Saunders  and in the 1950s by Feinstein et al. The subject has been revisited in recent times as well. [26–28] The consistent findings in these studies have been that injury or irritation to deep paraspinal soft tissue structures, such as joint capsules and paraspinal ligaments, will induce a type of referred phenomena with symptoms that are often indistinguishable from radiculopathy. Moreover, although these phenomena were shown to be reproducible across experimental subjects, they manifest in somatic patterns that do not correspond to expected dermatomal or myotomal distributions. Spinal fracture or dislocation, as required in the QTF-WAD’s modification, is an uncommon whiplash injury. Conversely, disk disruption and ligamentous injury, as described in the Croft grade 4 definition, are common elements of the whiplash injury continuum. [35–40] A potential difficulty of any ordinal descriptive system is the potential for nonuniformity in distances separating categories. So, although it cannot be assumed that the distances between grades 1, 2, and 3 are arithmetically isomorphic, from a probabilistic point of view, the gap between the QTF-WAD GRADE 3 and grade 4 is substantial and will have the effect of telescoping the majority of real-world whiplash injuries into a narrower range of categories. Accordingly, if our sample of 118 whiplash injuries is representative of the universe of whiplash injuries, the original grading system  can be expected to provide a more rational distribution of the most common injury severity spectrum and a more clinically relevant grading schema. Finally, it should be said that although we used recovery as our dependent variable, the ability to predict outcome is not necessarily the most important function of a grading system. It has been reported, for instance, that the QTF-WAD grading system did not predict recovery as well as did the precrash risk factors. We are aware that numerous putative risk factors concerning whiplash injury have been reported, and these can be expected to be more prognostically deterministic in individual cases. The subjects were recruited as a convenience sample, and self-selection bias is always a potential concern. However, none of the participants were involved in litigation, and there were no other obvious incentives for self-selection other than a $15 Starbucks coffee card which was offered to all participants. The retrospective nature of case-control designs makes them vulnerable to recall bias. Our inclusion of a recovered whiplash control group, however, would have neutralized that source of bias. Practitioners use numerous methods in the evaluation of range of motion, and these fall along a continuum of precision. Misclassification of cases can result in information bias, although it is likely to be a nondirectional form of bias. Although the decision process of most practitioners is guided chiefly by current practice standards and clinical indicators, diagnostic suspicion bias (exposure suspicion bias) could have affected decisions for MRI examination which could have informed in such a way as to downgrade grade 3 patients to grade 4 status in some cases. The interpretation of MRI studies within the current context entails some degree of subjectivity, and we did not attempt to independently verify the radiologists’ readings or the clinical interpretations made by clinicians. All MRI impressions, however, were provided by board-certified radiologists who were not aware that these subjects would be included in a research project. All of the treating practitioners specialize in spinal conditions and have an average of 23 years of clinical experience. Finally, study subjects were asked to rate themselves as having either recovered or not recovered. They were not provided with a specific definition of the term recovery, nor were they offered any instructions for use in determining their status in that regard. It is likely that variability in individual interpretation may have introduced a degree of imprecision, but it is expected that this would merely exert a nondirectional, toward-the-null form of bias. This study looked at 118 subjects who had experienced whiplash injuries, 64% of whom had developed chronic pain. Their injuries were classified on the basis of the original Croft whiplash grading system and on the basis of the QTF-WAD modification. Cross-tabulation statistics were used to determine the predictive power of each using the patient’s self-rating of recovery as the outcome of interest. Both grading systems demonstrated predictive power, but the original grading system achieved higher correlation coefficients and greater statistical significance. The QTF-WAD modifications result in a collapsing of data with a corresponding compromise in the ability to differentiate across the common spectrum of whiplash injury severity seen in real-world data. It is expected that many other factors are likely to affect any individual’s recovery status and that those will often be more deterministic on a case-by-case basis. The primary value of grading systems is their provision of a common language and improved communication in research and clinical practice. Further refinements in these grading systems are likely to accrue as a result of continuing research, particularly research that includes all 4 grades of whiplash severity that are commonly treated in clinical practice. This study was funded by the Spine Research Institute of San Diego. No conflicts of interest were reported for this study. Dr Croft is the developer of the Croft grading system. Freeman, MD, Croft, AC, Rossignol, AM, Centeno, CJ, and Elkins, WL. The economic and societal impact of motor vehicle crashes, 2010. Norris, SH and Watt, I. The prognosis of neck injuries resulting from rear-end vehicle collisions. Treatment paradigm for cervical acceleration/deceleration injuries (whiplash). with a review of prognostic research. Spitzer, WO, Skovron, ML, Salmi, LR et al. Hartling, L, Brison, RJ, Ardern, C, and Pickett, W.
Prognostic value of the Quebec Classification of Whiplash-Associated Disorders. whiplash-associated disorders: symptoms and clinical findings. Soderlund, A, Olerud, C, and Lindberg, P.
and prognostic factors in long-term symptomatology. Hell, W, Schick, S, Langweider, K, and Zellmer, H.
influence of car seats and possible evaluation criteria. Jakobsson, L, Norin, H, and Bunketorp, O.
Whiplash-associated disorders in frontal impacts: influencing factors and consequences. Whiplash following rear end collisions: a prospective cohort study. Karnezis, IA, Drosos, GI, and Kazakos, KI. study of a cohort of 134 patients pursuing litigation. Mascarenhas, JC, West, SC, and Zammit, CA. update of a systematic review and meta-analysis. Croft, AC, Burkholder, GJ, and Gutierrez, ML. Do risk factors for acute whiplash injury also predict non-recovery? Hours, M, Khati, I, Charnay, P et al. between patients with whiplash versus other injuries. Carroll, LJ, Liu, Y, Holm, LW, Cassidy, JD, and Cote, P.
their presence, intensity, and association with pain recovery. Merrick, D and Stalnacke, BM. Relationship between symptoms and psychological factors five years after whiplash injury. Gun, RT, Osti, OL, O'Riordan, A, Mpelasoka, F, Eckerwall, CG, and Smyth, JF. Risk factors for prolonged disability after whiplash injury: a prospective study. Olsson, I, Bunketorp, O, Carlsson, SG, and Styf, J.
Inman, V and Saunders, J. Referred pain from skeletal structures. Feinstein, B, Langton, JNK, Jameson, RM, and Schiller, F.
Experiments of pain referred from deep somatic tissues. The cervical zygapophyseal joints as a source of neck pain. Dwyer, A, Aprill, C, and Bogduk, N.
Aprill, C, Dwyer, A, and Bogduk, N.
Cervical zygapophyseal joint pain patterns II: a clinical evaluation. implications for assessment and management. Sterling, M, Jull, G, Vicenzino, B, and Kenardy, J. Characterization of acute whiplash-associated disorders. Medical and car impact-related risk factors for the prognosis of WAD. Kristjansson, E and Jonsson, H.
insidious onset neck pain: a cross-sectional study with an 18-month follow-up. Steinberg, EL, Ovadia, D, Nissan, M, Menahem, A, and Dekel, S.
Whiplash injury: is there a role for electromyographic studies?. Sterling, M, Elliott, JM, and Cabot, PJ. relationship to sensory and muscle measures: a longitudinal cohort study. PLoS One. 2013; 8 ([Epub 2013/10/23. Wilberger, JEJ, and Daffner, RH. Hyperextension injuries of the cervical spine. Rauschning, W, McAfee, PC, and Jónsson, HJ. Pathoanatomical and surgical findings in cervical spinal injuries. Ziemba, MA, and Bloze, AE. Cervical spine hyperextension injuries: MR findings. Some observations on whiplash injuries. Taylor, JR and Twomey, LT. Acute injuries to cervical joints. Mechanisms of injury and associated forces in high speed rear end impacts. Kivioja, J, Jensen, I, and Lindgren, U.